Yesterday the sight of a scruffy, fluffy peregrine chick gulping down a beakful of meat had a fair few of us punching the air. High atop Salisbury Cathedral’s tower (the highest in the country, as it turns out! 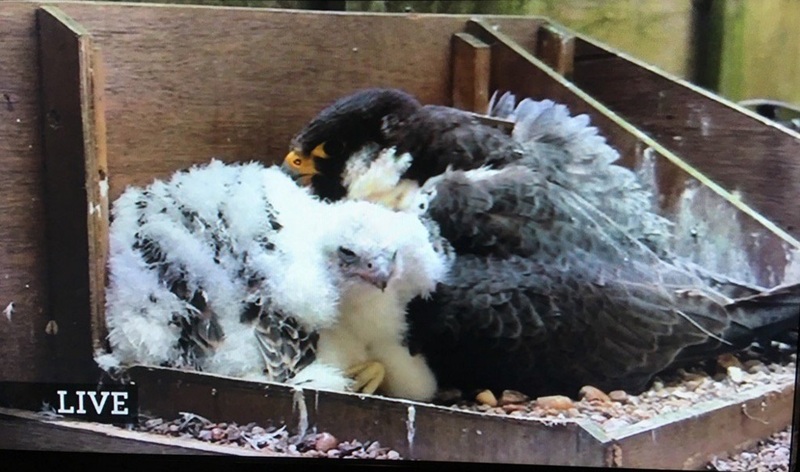 ), huddled around TV monitors, we watched as the cathedral’s nesting peregrine fed her new foster chick for the first time – signalling that the chick had been accepted into the nest. A few hours later, the footage went out to millions on Springwatch, and the whole country was able to share in our joy in this success story. This morning, we tuned into the live webcam and watched the new family snoozing together, huddled in an indistinguishable mass of feathers. The original chick seems happy with its new sibling, and both birds are being fed by the adults. Meanwhile, the other two orphan chicks have been successfully placed in a new nest in the Midlands. A job well done all round! However the question of how the parent birds were killed still remains – this is now being investigated by police and we hope that someone will come forward with information. 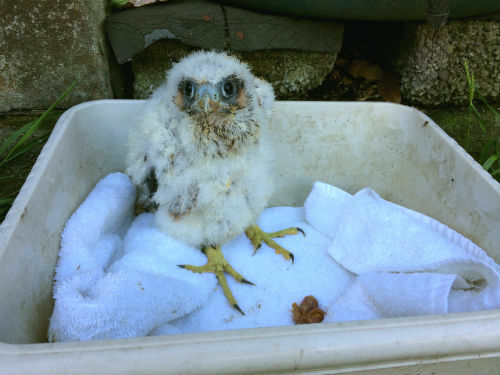 Over the weekend, we blogged about three peregrine chicks which were rescued from a nest in Shropshire after the parent birds were found illegally killed. The rescue went swimmingly – you can watch the video here! – but this left us with three fluffy, noisy peregrine chicks in need of a home. The decision was reached to foster the orphaned chicks into carefully-selected nests in the wild. A suitable nest was identified in the Midlands, and the third chick, the smaller male, would be fostered in the Salisbury Cathedral nest, as featured on Springwatch. Tune in on Wednesday night, BBC2, to see how the chick is getting on with his new family. Fostering has been done before, always with success, and was the only option in these extreme circumstances (keeping the chicks in captivity would have greatly limited their chance of success). Choosing the right foster nests, however, was crucial. We wanted families with no more than one or two chicks, of a similar age to our orphan chicks. 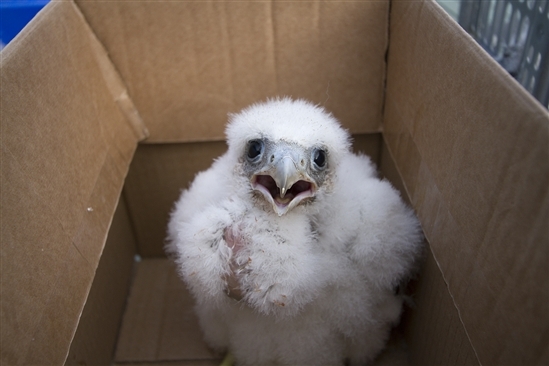 Peregrine parents usually raise 2-4 young, and should accept a newcomer and raise it as its own. We also needed nests which were easy to access, so as to cause minimal disturbance. Better still, because the Salisbury Cathedral nest has a camera on it, we will be able to watch the chick’s progress! Peregrine chicks rescued after adults found dead in Shropshire - guest post by Tim Jones of RSPB Investigations. Last Wednesday was shaping up to be a rather uninspiring office day at work, but as I’ve come to learn from this job, days can change in the blink of an eye. I got a call informing me that a peregrine falcon had been found dead at Clee Hill in Shropshire. There was no sign of the other adult and this left a nest of young chicks dependent and vulnerable. I quickly got my stuff together and set off, stopping to pick up Darren Thomas from Adventures Are Us who had hastily been recruited to do the climbing to rescue the chicks. As we were driving I was aware that, behind the scenes, frantic back-up calls were being made simultaneously by several staff at RSPB's UK Head Office in Sandy to inform the Police, Natural England, a vet and a raptor rehabilitation centre, amongst others. We arrived and met the local raptor workers – part of the Shropshire Peregrine Group who do a fantastic job looking after peregrines. Driving round to view the crag where the nest was, we saw the dead adult peregrine – an extremely sad sight lying on its back on the grass. Continuing on just a little further and I found the body of the other adult peregrine lying close to the original bird. A truly harrowing sight to see two of the fastest birds in the world lifeless on the ground. But there was still a chance to save the chicks. Liaising with quarry staff, Darren set up his ropes and then, naturally, it started raining! Knowing that the chicks were quite young (still fluffy and unable to protect themselves from the weather) it really was a race against time. While Darren descended towards the nest, I collected the bodies of the adult birds: these would be sent off for testing to determine the cause of death. I also fielded calls from Sandy HQ and kept them up to date with the situation. Before long, after a tense descent in unfavourable weather, Darren was safely back on the ground with three fluffy peregrine chicks. All three seemed healthy (if a little hungry) and they certainly let us know with lots of loud calling! Unfortunately, these kind of cases aren’t unusual in this job and I had strong suspicions. Nearby, we found a dead pigeon with its breast plucked clean, lying on its back almost directly above where the female peregrine was found. This was also carefully seized as an exhibit to be tested. As required to legally possess wild birds in these situations, we got the noisy chicks straight off to local vets for a check-up. After an 'all clear' from the vet, we gave the chicks their first feed in at least 24 hours. Needless to say they were very hungry and scoffed down all the food offered! With the chicks now settled and content we had the heads up that Jean Thorpe who runs a brilliant rehabilitation centre near York had agreed to take the birds. The birds arrived at Jean's in good condition and enjoyed another feed! It was clear they each had their own characteristics: the two larger females were very noisy and the little male quiet but clearly very eager to eat as much as he could to catch up with his sisters! 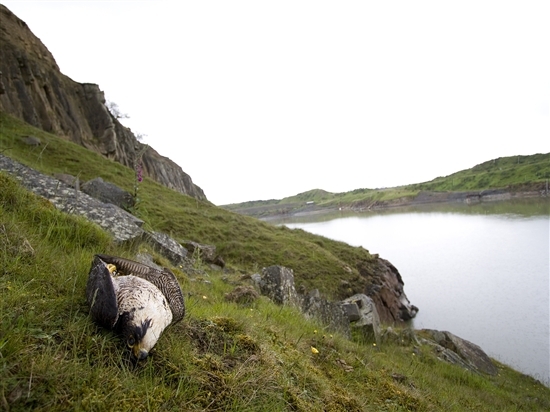 Clee Hill has a history of Peregrine persecution and at this time it is strongly suspected that the dead birds have been deliberately and illegally poisoned. West Mercia Police Wildlife Crime Officer PC David Walton said: "We urge anyone with information about the death of these magnificent birds to come forward, quoting incident ref 0676 S 30/5/17. "I believe that, had it not been for the fast action of all parties working together, we would have certainly lost the chicks as well as the adults, which look to have been poisoned." A rewarding but sadly typical day fighting raptor persecution for the RSPB. Next, we hope to place the chicks into foster nests early next week - watch this space!